Srinagar, Aug 20 (KNS): Jammu & Kashmir Police is organising ‘Run for Peace-2018’ a state level marathon on 2nd September-2018 at Srinagar. The marathon is being organised by Jammu and Kashmir Police under Civic Action Programme and large number of school going children and people of different age groups are expected to participate in the event. This was disclosed by A.K.Choudhary-IPS, ADGP Armed during a meeting held here at Armed Police Headquarters, Batamaloo Srinagar. Choudhary, who is also the organising secretary of ‘Run for Peace-2018, said that 4.00 lacs are being distributed as cash prize among 35 outstanding athletes participating in different competitions during the event. “To ensure participation of maximum public, the event been divided into five different categories based on distance to be covered by the athletes which include Full Marathon of 42 km for men, Half Marathon of 21 km for both men and women (to be flagged off separately), 8 km run for under-14 boys, 6 km run for under-14 girls, Run for Fun of 4 km for both men and women irrespective of age he added. 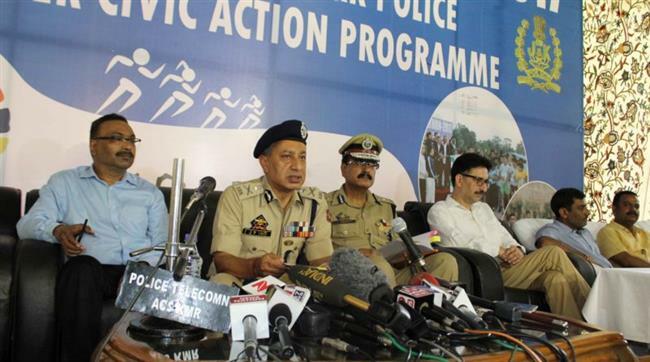 The ADGP said that the marathon is open to all and the aspirants who can register themselves at Sports Control Room, Lake View Police Golf Course Srinagar and Sports officer of J&K Police at Armed Police Headquarters, Batamaloo Srinagar, between 10 am to 6 pm on any working day. While addressing the meeting, ADGP Armed said that different committees have been formed for smooth and successful conduct of the event. The participant shall be provided T-Shirt and refreshment packets for which all the arrangements have been made on the ground.